Fisheries Administrator Beverly Wade confirmed to Amandala today that Belize has been “blacklisted” by the European Parliament’s Fisheries Committee, on allegations that Belize and seven other countries—Cambodia, Fiji, Guinea, Panama, Sri Lanka, the Togolese Republic and the Republic of Vanuatu—have been deemed uncooperative in the fight against illegal, unreported and unregulated (IUU) fishing. Belize has been listed due to its high seas fisheries, operated in international waters by foreign vessels which register here but which operate outside our national jurisdiction. Wade told Amandala that since 2010, Belize has been in a series of discussions and meetings with the European Commission, in relation to its concerns, and the country had been given until this month, May, to provide feedback on the latest correspondence. When we contacted the Fisheries Department early Tuesday to ask about the EC listing of Belize, Wade was surprised, since she had seen no official correspondence warning Belize before or after the European Parliament voted on Wednesday, April 24, 2013. According to a report appearing today on the website of the Technical Centre for Agricultural and Rural Cooperation (CTA), an ACP-EU institution, on 15 November, 2012, the European Commission had adopted a decision indicating that the 8 countries have an insufficient record in tackling IUU fishing, and that they risk being identified as countries it considers non-cooperative in the fight against illegal, unreported and unregulated (IUU) fishing. The decision, the CTA notes, did not entail any trade-affecting measures. Should the situation not improve, the EU could take further steps, which could entail trade measures such as a ban on selling fisheries products to the EU, the CTA said. Wade told Amandala that with the vote by the European Parliament, Belize may not be able to land high seas fisheries products in the EU. Our newspaper was previously informed that 28 Belize-flagged vessels land their catch, made up of tunas, tuna-like species, sharks and other related species, in the EU market at varying frequencies ranging from twice a year to monthly. 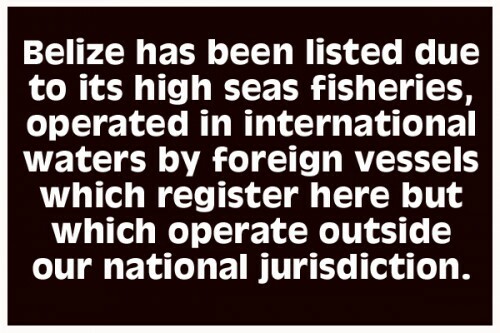 The EU listing is unprecedented, and indications are that if Belize is excluded from the high seas fishing industry now, it could be permanently boxed out due to high competition led by developing countries and limited quotas. We understand from well-informed sources in the sector that a major bone of contention is Belize’s open registry, administered by The International Merchant Marine Registry of Belize — IMMARBE, which allows foreigners, including Europeans, to be able to register their vessels in Belize and land products in the EU under tax-free status, using IBCs (International Business Corporations) registered in Belize. Wade told us that Belize is in the process of revising its fisheries laws, which would also include new measures to address concerns that had been raised by the EC. The new Aquatic Living Resources Bill has yet to be introduced in Parliament, although the Government of Belize is committed to passing the new law. The Fisheries Administrator indicated that they will continue with measures to tackle concerns over IUU fishing, particularly as they relate to high seas activities.